Welcome to the Clarion Hotel Helsinki, an exciting new meeting place that’s 78 metres high. Enjoy the stunning rooftop pool, 425 rooms, the Sky Room, a conference centre for up to 1,000 people and our Kitchen & Table restaurant by Marcus Samuelsson. Kitchen & Table by Marcus Samuelsson is ready to welcome Helsinki's food enthusiasts. The Kitchen & Table restaurant concept has enjoyed great success in recent years at several Clarion Hotels in Sweden and Norway - and now it's Finland's turn! Welcome to Kitchen & Table, a restaurant concept that combines traditional Finnish ingredients and local traditions with Manhattan flavours. Our food philosophy "fun dining" focuses on social eating, an open kitchen and an urban atmosphere. It's no secret that New York-based top chef Marcus Samuelsson has taken both Manhattan and Harlem by storm. He has become an internationally acclaimed chef and expert on food matters thanks to the exciting flavour combinations at Aquavit that stunned the critics and his own restaurant, Red Rooster Harlem. Marcus has also appeared in the American media - notably cooking with Michelle Obama on "Good Morning America" and winning the cooking competition "Top Chef Master". In addition to his popular cookbooks and honours from the New York Times, Washington Post and Chicago Tribune, he has even prepared a state dinner for President Obama at the White House. Kitchen & Table has a double premiere in Helsinki. In October 2016 we opened our sister restaurant Kitchen & Table at the Clarion Hotel Helsinki Airport. Are you travelling to Sweden or Norway? Check into a Clarion Hotel and discover more of our restaurant concepts in collaboration with Marcus Samuelsson. 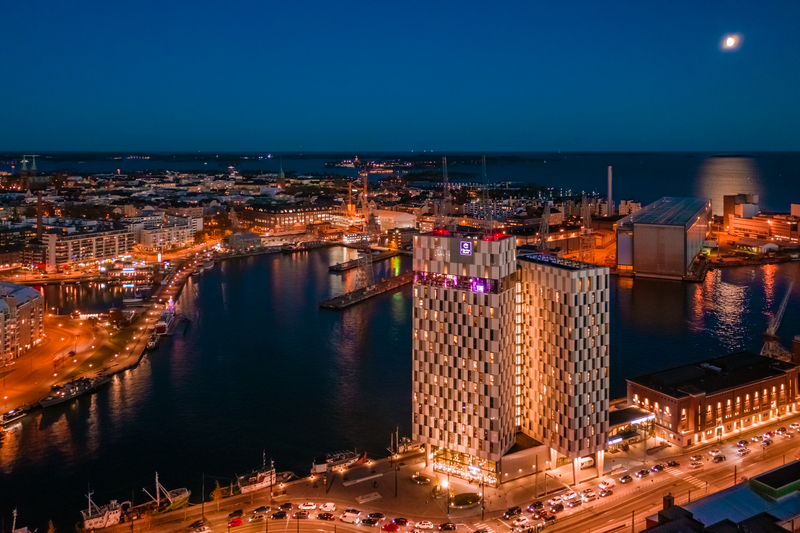 Try the Norda Bar & Grill at the Clarion Hotel Post, American Table at the Clarion Hotel Sign, Eatery Social Taqueria at the Clarion Hotel Malmö Live and at the Clarion Hotel Stockholm, as well as the Kitchen & Table restaurants of course. For more information and reservations, please don't hesitate to contact us on +358 40 162 3850, or at kitchenandtable.helsinki@choice.fi. Kitchen & Table Helsinki does not serve lunch during Easter 18.-22.4.2019. The age limit for Sky Room is 18 years after 8pm. Soup lunch with freshly baked bread available from Monday thru Friday at 11.00-14.00. Welcome to enjoy lunch at Living Room Bar!